While the Andhra police have filed a case against Principal Venkata Ramana, he is yet to be arrested. They all hail from tribal communities. They are the first from their families to attend school. But little did the students of the government-run Tribal Welfare Residential School in Dargamitta of Nellore town in Andhra Pradesh, know that their Principal would become their living nightmare. Two days ago, several photographs and videos surfaced on WhatsApp and other social media platforms showing Principal Venkata Ramana mercilessly beating young students. 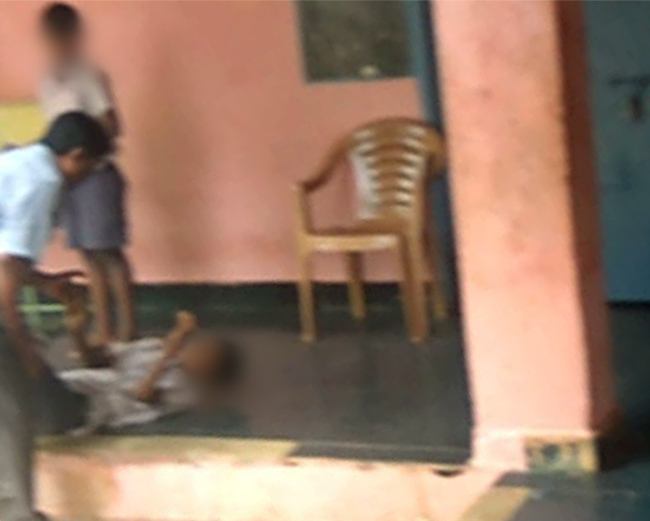 While one photograph shows the principal taking a boy’s head in his hands and banging it against a pillar, as other students watch, another shows a student on the floor as Venkata Ramana appears to be in the act of hitting him. Yet another picture captures the principal asking a young student to come forward, even as he pulls down his pants before a beating. A fourth photograph shows Venkata Ramana grabbing a boy by his hair, while one photo shows him grabbing a boy by his collar. A video that was taken from the school captures Venkata Ramana using a stick to beat two young students. Another clip shows the principal kicking a boy, as a colleague continues to do his work. Sources say that the principal would resort to ‘corporal punishment’ regularly, for one reason or the other. Andhra Pradesh Yanadi Samakya, an organisation that works for tribal rights on Tuesday complained to the Nellore District Collector and SP about Principal Venkata Ramana, who allegedly regularly assaulted his students. Speaking to TNM, Gandala Sreeramulu, the state president of Yanadi Samakya and a former bureaucrat said, "The inhuman assault on children has come to our notice. We have lodged a complaint with district authorities to look into matter and take necessary action." He also said, "The horrific visuals show how inhumanly he was punishing them instead of disciplining them. Police is investigating the matter. Stern action should be taken against him." A case has since been registered against Principal Venkata Ramana under section 75 of Juvenile Justice Act 2015, SC&ST Prevention of Atrocities Act along with IPC 323 (causing voluntary hurt) and 324 (causing hurt with dangerous weapon or means), said Nellore's Vedayapalem Inspector. The case is being investigated by the DySP. Venkata Ramana is, however, yet to be arrested. Speaking to TNM, the Vedayapalem inspector said, "It is alleged that he is beating up tens of students regularly. A teacher from the same school took the videos and shared it. An investigation is underway." Police and Child Welfare Department officials are also taking statements from the students.